In a corner of northern Myanmar, on the border of China, there is a long running civil war we rarely hear about. The Kachin Independence Organization, or the KIO, and the insurgency it has waged has been going on since the 1960s. But it has intensified over recent months, as the military wing of the KIO, the Kachin Independence Army (KIA) has lost many of it major outposts. It’s on the verge of being wiped out by government troops and bombs. Asia Calling correspondent Kannikar Petchakaew secretly travelled to the front line of the conflict to find out more. Ja Sieng is three months old. She was born in a makeshift shelter, lulled by the sound of mortar shelling. On June 9, 2011, the 17-year-long ceasefire agreement between the Myanmar Army and the KIO fell apart. 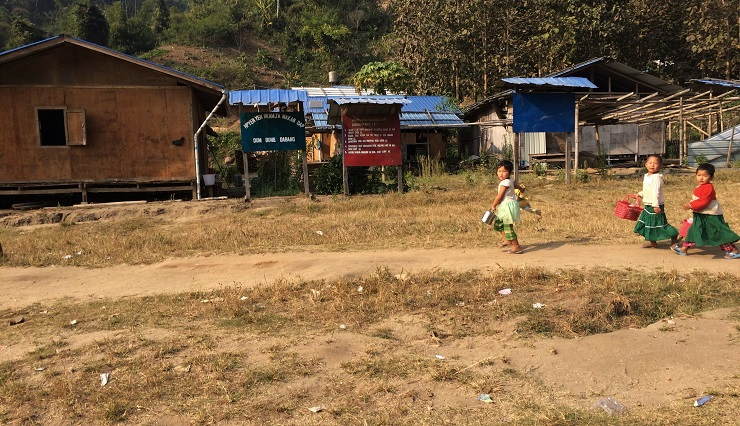 Kachin state, home to one million people, turned into a war zone. Fights raged between the army and the KIO, which has long struggled for independence. Over the past six years more than 120,000 people have been displaced, including baby Ja Sieng and her family. Ja Sieng’s mother, Ja Grong recalled the night she last fled. “The sound of the mortar was so close and so scary, there were weeks of sleepless nights, and on one early dawn, the mortars fell really close. Nobody was hurt but we were too scared to stay. We ran with the children in our arms to the school nearby,” recalls Ja Grong. It was not the first time, and probably won’t be the last. When the fighting gets too close they are forced to take refuge wherever they can. People in Kachin know all about running, over and over again. 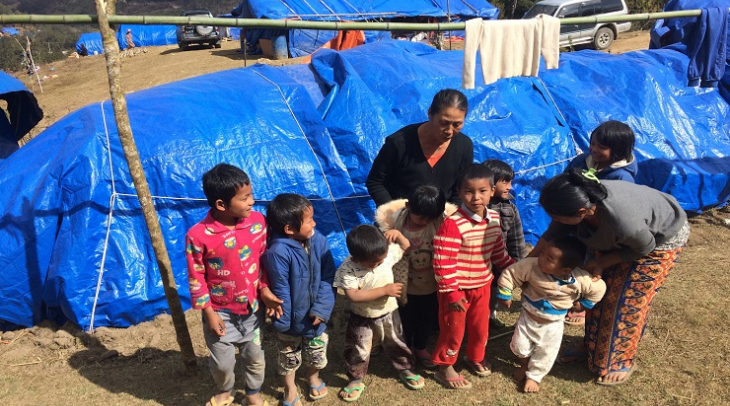 “We came back to this camp when the school started to resume classes. We don’t feel safe at all, but we have no choice but to stay,” said Ja Grong. 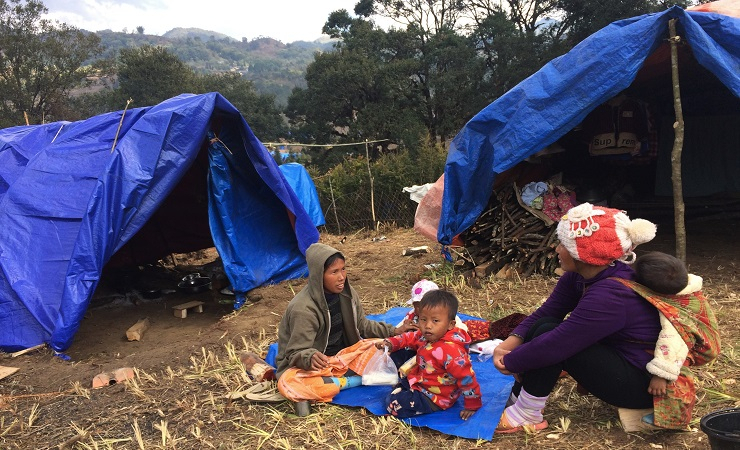 With the border between Myanmar and China tightly closed, displaced people in Kachin have nowhere to go. 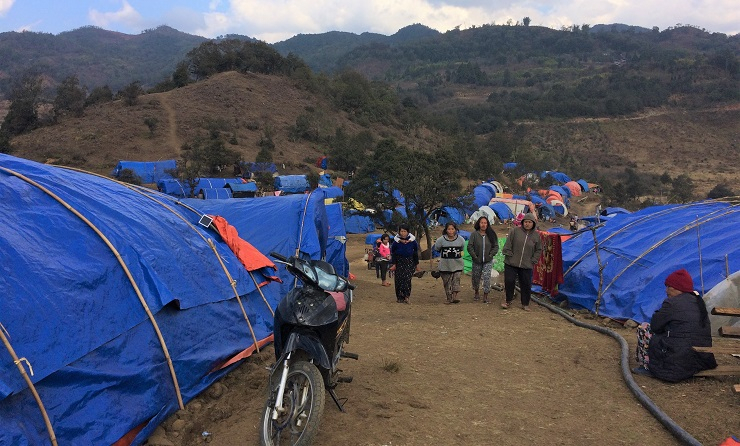 Internally Displaced Persons, or IDPs, are housed in more than 100 makeshift camps, mostly in rebel-controlled KIO areas. The camps are made up of hundreds of dusty bamboo shacks, swaying on swampy ground. There is no electricity or water, and instead of roofs they use cardboard instead. Some have lived in the camps for six years now. Pok Ja wants to go home, she tells me, but it’s impossible. She doesn’t have a house anymore because the army destroyed it. 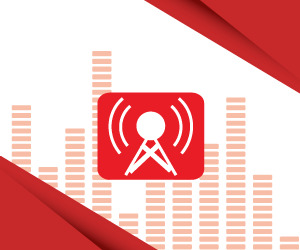 Since early last year humanitarian assistance, including that from the United Nations, was blocked by the government from entering KIO-controlled territory. Zaw Raw is the head of the Refugee Relief Committee on the KIO side. “Last May The World Food Program’s trucks transferring food supplies were told to turn back on the way here. They never come again since,” Zaw Raw reported. He says the situation in the camps is close to despair. Teachers in this IDP school are deeply worried. It’s been a month since any rice has been delivered by NGOs and supplies are running low. The students are now down to two meals a day. 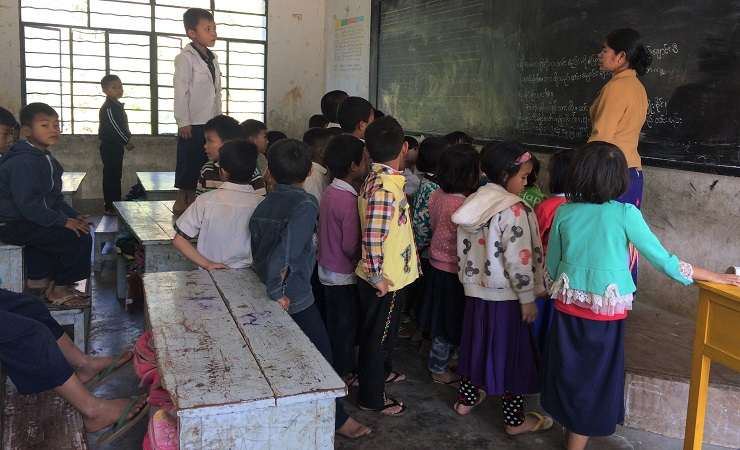 Here in Kachin, the students are traumatized by war. They’ve seen violence no child should see. And with rations down they’re hungry and it’s hard to concentrate in class. Many have dropped out, sometimes for odd jobs, sometimes to steal. Others have fled. Four hours along this bumpy road, north of Laiza, is the capital of the KIO. It’s at the peak of a mountain called Shaityang, and it’s freezing cold at night. But it’s spring, and there’s a smell of fresh bamboo in the air, newly cut to make shelters in the camps. San Noring is 10 years old. He arrived here two weeks but strolls around the camp freely, in ragged clothes and without any shoes, because the camp’s school isn’t finished yet. He fled here with his parents and thousands of others. They were living in a camp close to the Chinese border when heavy shelling got dangerously close. San tells me they tried to cross into China, but border guards forced them back. So they slept along the river without any shelter for two weeks before being relocated here. The next round of peace talks hosted by the government, and which include the KIO, will take place in Yangon at the end of this month. People here though, are sceptical they will lead to real change. But after years of slow progress, what they want to see is peace. As do the children of war.